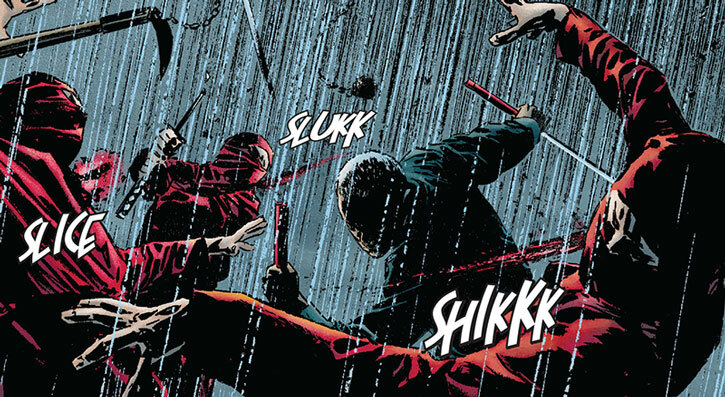 Master Izo is a really tough Daredevil character who appeared in 2008-2011. 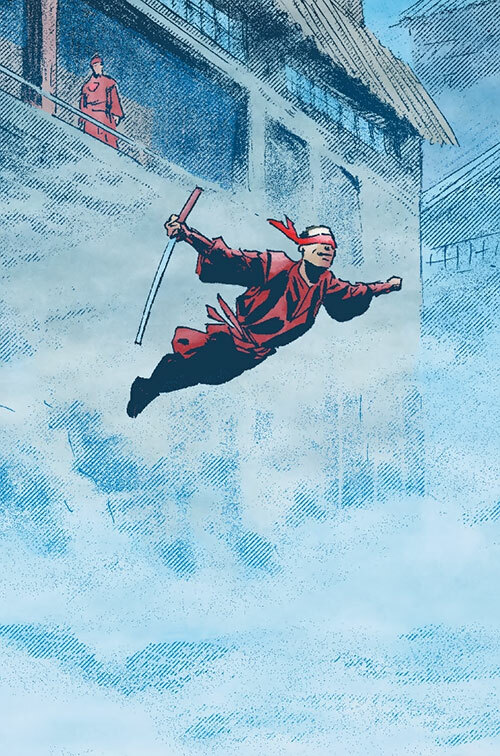 He’s a renegade ancient blind ninja master, but then who isn’t. 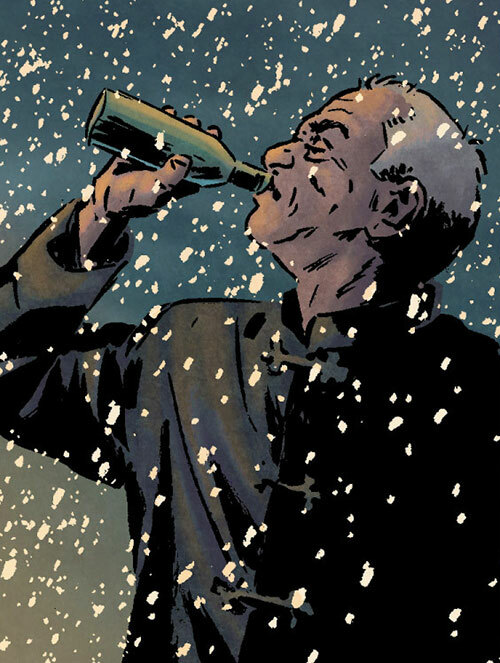 Other Aliases: The Old Man. Group Affiliation: Ally of Daredevil; formerly the Hand, the Chaste. 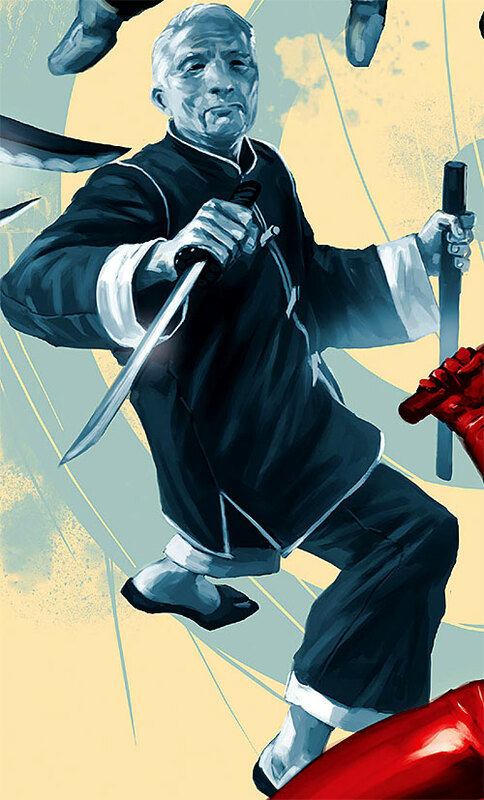 Master Izo is one of the most skilled martial artists alive, with centuries of experience. Despite being blind, he’s trained his senses to compensate, so the disability causes him little trouble. He can slow his pulse sufficiently to fake death, can contact the minds of others, and knows some secret to slowing the aging process. Master Izo is centuries old. He was one of the original members of the Hand in feudal Japan. He grew so disillusioned with its fall from an honourable group to demon worshippers that he put out his eyes and left the group. The extent of his travels are unknown. 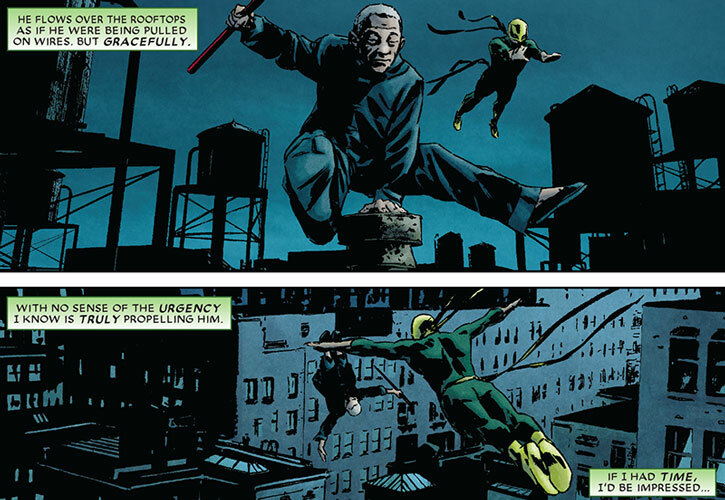 But he’s mentioned in the Book of the Iron Fist, and remains a mythic figure in certain circles. The Hand refer to him as the Old Man, and try to kill him. He later went on to found the Chaste to oppose the Hand, only for them to grow too rigid in their ways. They frowned on his drinking and gambling, and eventually voted him out. His student, Stick, took his place as leader. 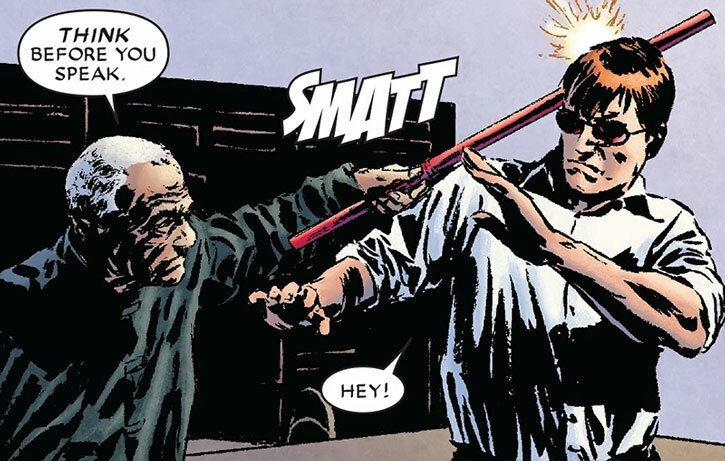 It was Izo who found Matt Murdock shortly after the accident that gave him his powers, and informed Stick of the boy’s abilities. He probably kept watch on Murdock, planning to use him in his war against the Hand. Taking as a student the young girl who’d go on to become Lady Bullseye, Izo trained her to infiltrate the Hand as his agent. He promised she’d become leader of the organisation, although that was a lie. 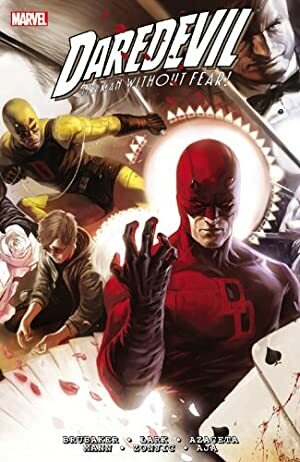 When the time came that the Hand moved to try and recruit Matt Murdock (Daredevil) as their leader, Izo travelled to New York so he could manipulate events directly. He introduced himself to Daredevil and Iron Fist, and recruited Black Tarantula as another mole to be planted in the Hand. Izo’s plan appeared to come to fruition as Murdock became leader of the Hand. Lady Bullseye was less than happy at the result, accusing Izo in private of using her. He admitted it without remorse, and they parted on less than happy terms. Izo had to fake his death as Murdock’s sacrifice to be accepted by the Hand. He left New York in order not to interfere with Murdock changing the Hand into what they wanted it to be, so wasn’t present to detect the plan being turned against them. By the time Izo realised the Hand elders planned to corrupt Murdock into an avatar for The Beast, they’d already established the Shadowland castle in Hell’s Kitchen. 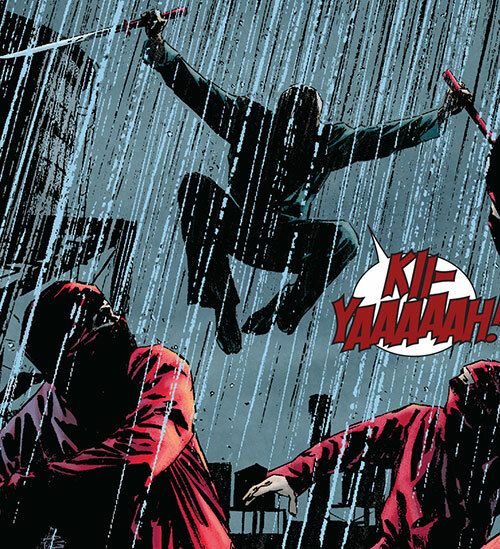 Recruiting Elektra, Izo returned to New York. Working with other costumed friends of Murdock they attacked Shadowland, and managed to exorcise The Beast from Murdock. Izo wandered away soon after. Cheerful and mocking, Izo’s irreverence can irritate the more serious martial arts types. While his casual nature is probably genuine, Izo is also patiently manipulative, viewing people as pawns in his long term plans to reform or destroy the Hand. If he respects someone he may be upfront about part of his plans, at least not lying to them. Iron Nerves, Language (Japanese), Lightning Reflexes, Slowed Aging. Daredevil (Low), Black Tarantula (Low), Iron Fist (Low). Comments: Allows Master Izo to make telepathic contact with one particular individual, drawing them into their mind. Unless they’re particularly competent, they’ll be unable to react to events around their body without Master Izo’s direction. Stick [EV 02 (04 w/STR, 12 w/Martial Artist) BODY 04]. Swords (x2) [EV 04 (05 w/STR, 12 w/Martial Artist) BODY 05]. While blind, it doesn’t really affect his interactions with the world, so I kept it to a Minor level. He may have trouble telling colours, but there’s little evidence of it really affecting him. It’s unclear what’s required to make telepathic contact with others, and he’s only used it once. I’ve written it as a Ritual, but it could as easily be a Skilled Power. Writeup completed on the 2nd of March, 2014.